The Arroyo Bolaxa is an important water body of fresh water in the city of Rio Grande and forms the Environmental Preservation Area Laguna Verde. He cuts a State Highway, as well as public and private property. His bed reaches depths of up to three meters and its shores are home to several species of flora and fauna. One of the public area stretches cut by this source, currently appropriated by the local population without any regramento and minimum supply of infrastructure, sets up the project intervention area. The Bolaxa Urban Park was created in 8 June 2011, through Municipal Decree, for conservation, environmental education and leisure. The decree provides for the implementation of the park aiming at the protection of species and ecosystems present there, as well as public use for educational activities, recreation and leisure; also mentions the control of human occupation in the adjacent areas. 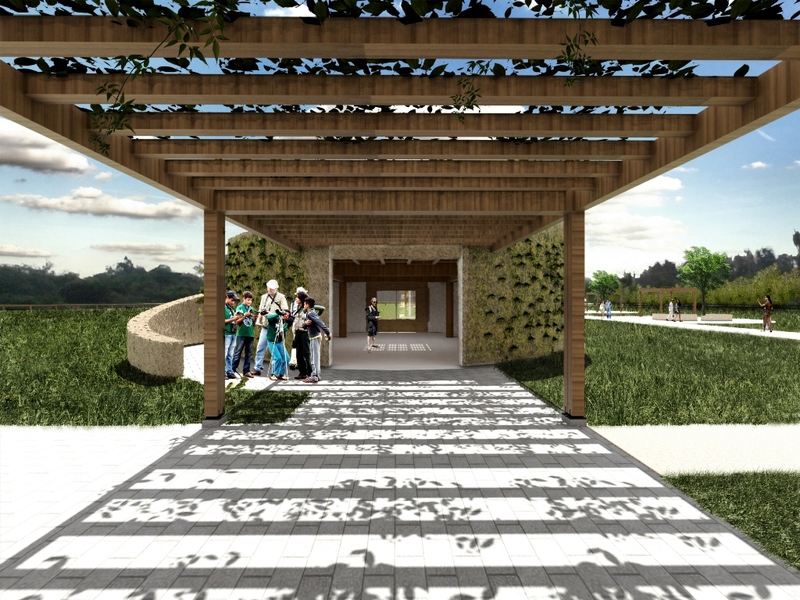 A empresa Bunge Fertilizantes S.A. is committed, by the municipal government and the public prosecutor, to hire the Architectural Design of Urban Park Bolaxa and perform the same enclosure. 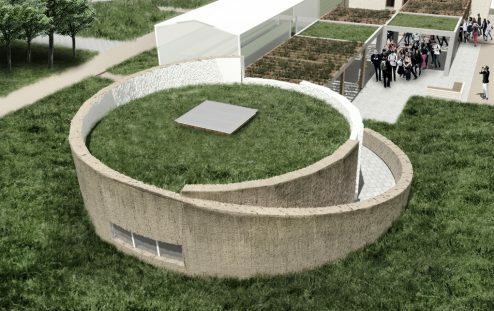 The project deals with the area of ​​inestimable environmental value in a unique way, trying to propose a suitable approach that respects the particularities of each of the sectors present in the space as well as enhances the currently identified uses. The developed proposal seeks to meet the needs and desires of both the government and the local population, but always keeping the focus on an extremely careful intervention, With regard to each of its propositions the lush natural landscape, comprising peculiar specimens of local flora and fauna. All new equipment designed for the Park consider the use of low environmental impact materials. In addition, the execution of such equipment dispenses large machinery, which will contribute to the preservation of the environment. Still is expected planting of native species in large areas of the Park, and such process is already underway, It is coordinated by the Municipality of Department of the Environment. The level 1, daily and intensive use, It is configured to access the park and consists of guardhouse control, parking areas for private vehicles and buses of visitors, as well as receive and guide users of space. 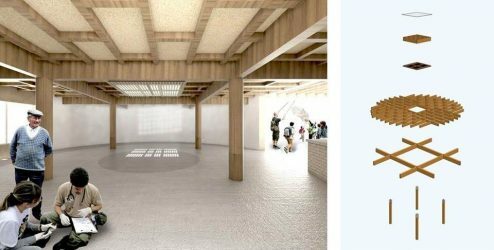 It also has kiosks, playground, amphitheater and the buildings of the Educational Nursery and Visitor Center and Environmental Education. at level 2, sporadic and extensive use, They are planned quite punctual interventions that seek to preserve the most unique features of the vegetation in this area. Thus, They were designed 5 Picnic areas with basic furniture plus a suspended wooden track that runs along the banks of the Arroyo Bolaxa. On the initiative of the SMMA, some points of this sector, especially those closest to the stream, already in phase reforestation with native species. But the level 3, is configured as a permanent conservation area and, therefore, It presents minimal interventions. 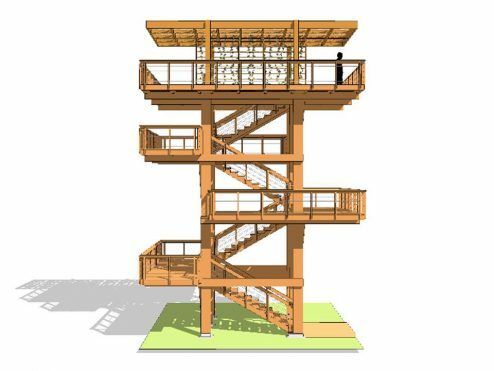 Basically, It is provided on site cleaning and delimitation of existing trails and the execution of an observation tower, with all wooden structure, where users can view from above the entire length of the park and its immediate surroundings. General aerial view of the proposed intervention. general implementation of Bolaxa Park. On the right the municipal Children's School (preexisting) and access to the park with the main areas and activities, corresponding to the sector 1 intensive and more urbanized. 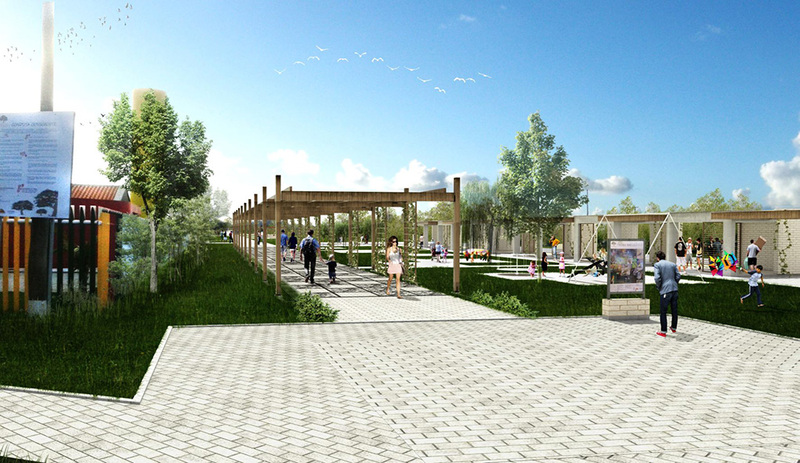 The percent urban park with leisure facilities, corresponding to the sector 2. And left the permanent preservation area with environmental visitation trails, corresponding to the sector 3. South, Arroyo Bolaxa. General aerial view of the proposed intervention. Diagram of the proposed zoning evolution, 1 and 2. Diagram of the proposed zoning evolution, 3 and 4. View of access to the Park, areas concierge and control, parking and bike racks. Square Park with access to leisure and spaces for exhibitions and events. Pergola and space for trade shows and events. high visitation walkways for permanent preservation area, next to Arroyo Bolaxa, located on the second level of intervention. Visitation Center, building for the reception and environmental education. Inside View and structural diagram of the Center for Visitation. 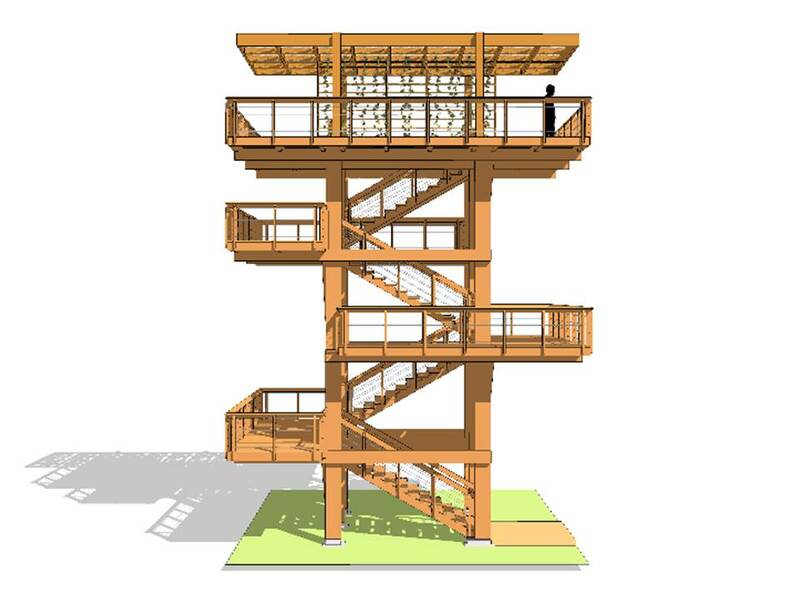 Observation tower with all wooden structure, located on the third level of intervention. Diagram of the rainwater collection system. Diagram of the water heating system. By: 3C Arquitetura e UrbanismoFiled under Urban Design, Buildings, Projects. Bookmark the permalink. View EXIF Data.